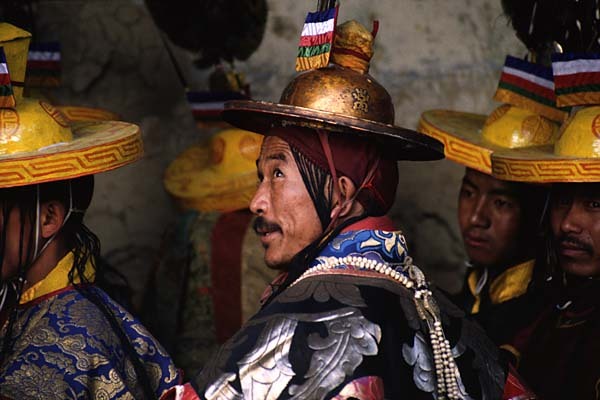 The Tiji festival is annual event indigenous to Lo-Manthang, Upper MUSTANG in Nepal. Tiji commonly pronounced "Teeji" is the abbreviated from of Tempa Chhirim which translates to "Prayer for World peace". Tiji commemorates the victory of Buddha's incarnation. Dhorje Sonam over a demon called Ma Tam Ru Ta, who was man eater and who caused storms and droughts to destroy people's houses and livestock. The dances performed by the monks of Lomanthang Chhyode Gumba during these three days festival enact the harassment of the Ma Tam Ru Ta, the birth of Dhorje Sonam the demon’s son and attempt by Dhorje Sonam to return the demon to the BUDDHA realm. 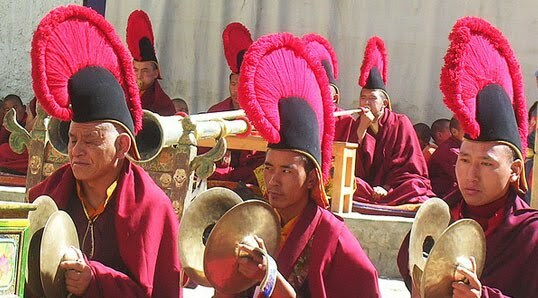 The monks perform a dance called “Tsa Chham” on the first day of the Tiji and “Nga Chham” on the second day, one monk has to stay in seclusion for three monks during the winter preparing for the role of Dhorje Sonam. One the third day, in a ceremony called “Rha chham” this monk in the role of Dhorje Sonam throws the effigy and Tsamppa representation of Ma Tam Ru Ta. It is believed that the village is purified of evil spirits at this time. 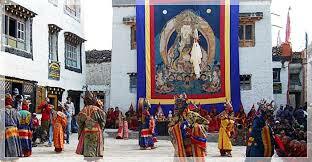 The Tenji festival falls from 27th to 29th days of third month of Tibetan calendar (April/may of every year). 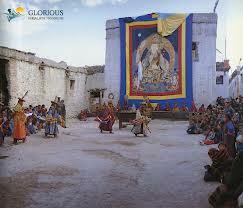 It is organized by Chhyode Gumba which is monastery of Sakyapa sect located in Lomanthang, Upper MUSTANG. The monasteries abbot is Khempo Tashi Tenjin Rinpochhe and there is close to 35 other from Lomanthang, Nenyol and Chhoser in the monastery. Villagers from all over “Lho Tshu Dhyun” (the ancient kingdom of Lo) come to watch the dance and to participate in the accompanying festivities the villager of Lo also contribute firewood and necessary material to under take the festival. Adventure Dolmala trek & Expedition organizes trek to the Himalayan Kingdom of Mustang targeting TiJI Festival a three days long ritual known as" The chasing of the Demons", one of the most important festival of the region. Over the festive time monks dressed in elaborate costumes and masks perform dances and rituals that are supposed to drive away evil spirits. 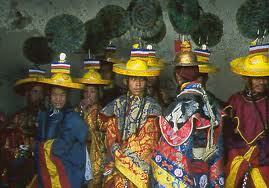 Dressed in their finery, people from all over Mustang gather in Lo Monthang to celebrate the Tenji Festival. 2014 may 16 Day 01: Arrival Kathmandu and transfer to Hotel. 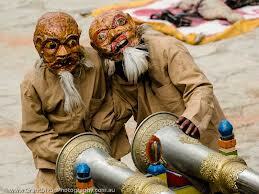 2014 may 17 Day 02: Kathmandu full day sightseeing (Bauddhanath , soyambunath and Pashunath). 2014 may 18 Day 03: Drive to Pokhara transfor to Hotel. 2014 may 19 Day 04: flight to Jomsom &Trek to Kagbeni. 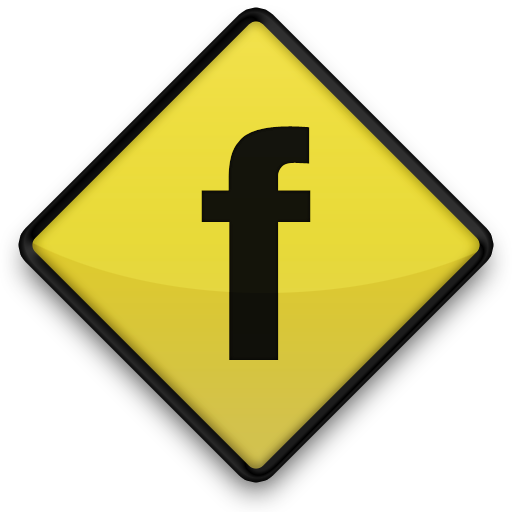 2014 may 22 Day 07:Ghiling –Dakmar-camping. 2014 may 26 Day 11:Lo-Manthang-Tiji festival. 2014 may 27 Day 12:Lo-Manthang – Tiji Festival Ends. 2014 june 1 Day 17:Muktinath to jomsom. 2014 june 2 Day 18: Jomsom to Pokhara. 2014 june 3 Day 19:Pokhara to Kathmandu. 2014 june 5 Day 21: Back to your Destination.